... because monitoring the brain matters! The NeuroWave Team welcomes you. 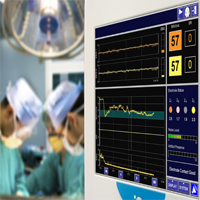 We are an ISO 13485 medical device company, dedicated to developing innovative, state-of-the-art signal processing technologies for the next generation of brain monitors for improved and safer patient care. NeuroWave is proud to offer the NeuroSENSE® Monitor, the latest generation of brain monitors for patient-customized anesthesia and sedation, now cleared for sale in markets recognizing the CE mark. The NeuroSENSE is the first bilateral brain monitor designed with independent indices for each brain hemisphere, which measure anesthetic effects on the brain and respond instantaneously to changes in patient state. This greater reliability and added insight into the patient's brain assists anesthesia providers to make optimal decisions for improved and safer patient care. Nov 7-9, 2018, Brussels, Belgium | Euro Neuro - Check out our new NeuroSENSE monitor at the QP&S booth!